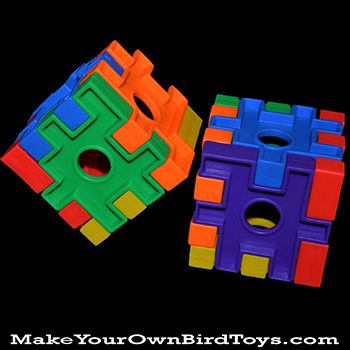 See where your imagination takes you with this Puzzle Cube Toy Base! 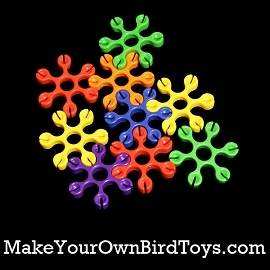 This plastic puzzle has six colorful pieces with a center hole in each piece. 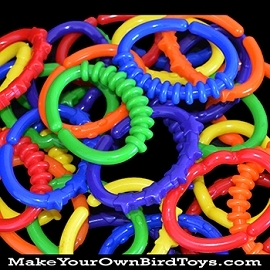 Hide food or fun to chew goodies in it or you can string your birds favorite toy parts on either rope, leather, or chain. 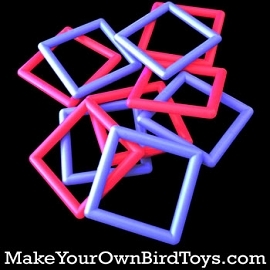 The assembled cube is measures 2-1/8" x 2-1/8" x 2-1/8" and the holes are 1/2" in diameter. Our Blue Front Amazon, after figuring out how to take apart and repeatedly doing so for about 6 mos, now sees their use as "shoes". 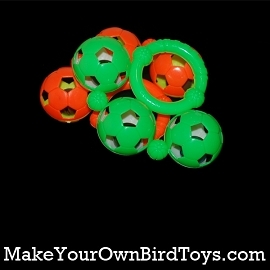 He stands with one on each foot and skates across the desk. Meanwhile the $30 parrot skates we purchased are apparently great fun to just throw on the floor. LOL.